Our service range includes a wide range of audio transcription services and video transcription services. Our organization is engaged in offering a wide assortment of Audio Transcription Services to our clients. Our audio transcription services also cover various business domains like events management, media and advertising, hospitality, publishing, television, legal, public relations, and broadcasting among others. Video Transcription Services is a process of transcribing voice dictations files in text format. Outsourcing Transcription Services is a transcription company providing accurate, speedy and cost-efficient audio transcription services. This is not about blowing one's own trumpet but rather about assuring all about the quality and reliability of our audio transcription services. 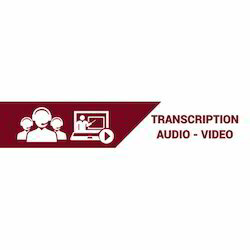 We have the transcribers to attend to the various demands in digital audio transcription. Our audio transcription services also cover various business domains, including, but not limited to, the following such as education and training, events management, media and advertising, hospitality, legal, public relations, publishing, television and broadcasting among others.